Blocks UV light from reaching bottom growing pond weeds by coloring the water blue. Our Pond Dyes turn your pond an alluring shade of blue to help prevent photosynthesis from occurring with in the pond. This will help keep algae from forming, provide safety for fish from predators and will help keep water cool in the hot summer days. 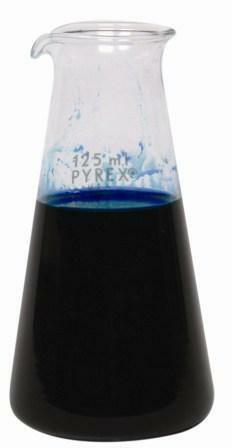 Blue Pond Tint is a mild dye and will not be an “overpowering” dye that you will not be able to see your fish. It is designed to act more like car window tint and not a complete cover. Blue Pond Tint is the perfect product for the pond during those hot summer months. Turn your waterfalls or garden pond a beautiful shade of blue. Non-toxic, safe for fish and plants. Non-Staining Food Grade Dye (Our yellow lab swims in our large pond that has a deep blue color and when he exits the pond, his fur is blue. Once he shakes off the water in his fur, he is yellow again with no blue stains in his fur). Use to block UV rays from reaching unwanted plants growing from the bottom of your pond. The sunlight cann't penetrate to those unwanted plants and they starve to death from the lack of benificial UV light. Filters sunlight & helps cool the water! The blue color creates a soothing visual picture for your body of water. This product is used at many golf courses around the world as well as at numerous miniture golf couses. The blue color also keeps people from tasting your water. This product is harmless to fish and wildlife. For smaller ponds, use at the rate of 1 pump per 100 gal./378 liters of water. The dye can last from 4 months down to 1 week depending on rainfall, water flow through the pond (or retention time of the pond) and the desired shading you want to keep. On an average: 4-6 weeks. 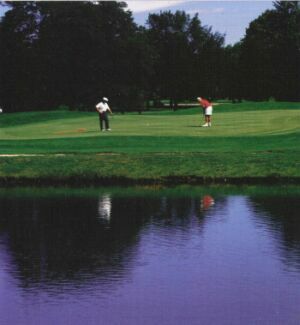 We have local retention ponds that require a boost every 2 weeks throughout the season. Usually it is the smaller ponds that have the potential of rainfall and watershed diluting the dye quickly. Just add more dye to get the desired shading back. Adding more dye throughout the season will keep your pond looking great.